Connected through our love for card making, blogging and being from Germany we (Tanja from Little Art Cottage and I) decided to create a monthly project within predefined requirements. We are going to show you the result every 3rd Sunday of the month and this is our twenty ninth transatlantic get-together! We also have an illustrious guest this time - it Tae Eun from Rainbow in November. Although her blog should be called Rainbow every day - she has an amazing eye for colors and her coloring skills are awe inspiring! I can't wait to see what she created! And that's what I did, creating a little scene with my Katzelkraft stamps. I used three different sets - the famous Les Rats des Villes, Les Jungles and the cute little mouse from Les Chats Russes. The sentimets are by Altenew and the little balloon is by Happy Little Stampers. I did some water coloring - partially with Inktense pencils. I made that card for my daughter, who got a 1.0 on her complicated semester project - she is right now doing her masters in Biomedical Engineering in Munich. Lets check out Tae Eun's and Tanja's artwork! Wow!!! You have a smart daughter! 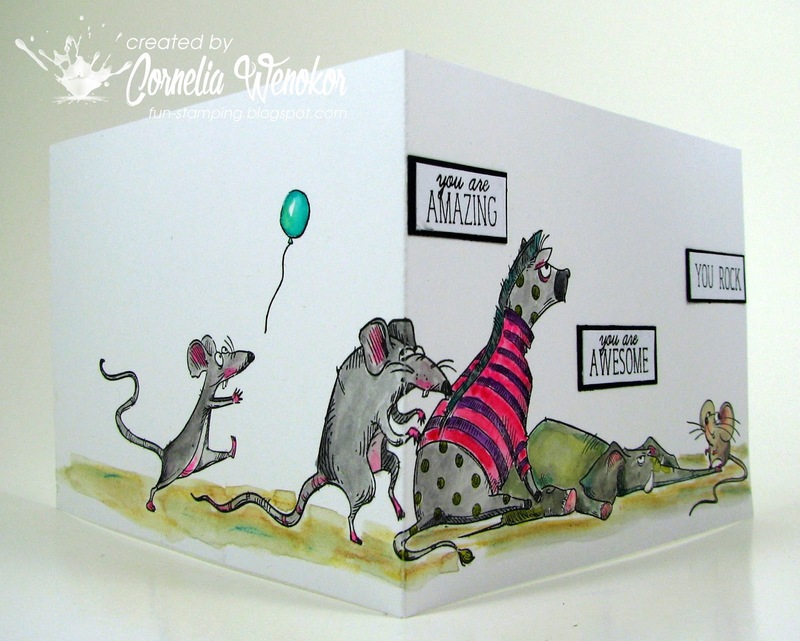 Great and fun congratulations card for her ! The grumpy animals made me smile :)! Thank you so much for inviting me!!! Die Typen sind soooo cool!!! Mega tolle karte!! You girls have created little masterpieces, Cornelia! LOve to carry my stamping to the reverse side of the card! BTW I have a connection to Germany - through CAKE!! LOve les Rats! and this fantastic scene! Diese Rattenkarte is einfach nur rattenscharf!!! Such a funny card. Love it! Thanks for sharing at CAS on Friday! Your fantastic scene just blows me away! So much fun, and a great way to extend to the back of the card - great idea! Congrats to your daughter, you have to be just beaming! WOW WOW WOW die Karte ist der Hammer, sowas von genial. Glückwunsch an Deine Tochter, sie wird sich riesig über diese witzige Anerkennung gefreut haben. Es nimmt kein Ende! Ratten wohin man schaut! Haha ... aber diese Schlawiner sind einfach zu toll und machen jede Karte zu einem Schmunzler! So cute! Wonderful card and coloring.